Années 1970-Human problem solving, (avec A. Newell), (1972), Englewood Cliffs, NJ: Prentice-Hall. -Models of discovery and other topics in the methods of science, (1977), Dordrecht: Reidel. -Models of thought (Vol. 1), (1979), New Haven, CT: Yale University Press. Années 1980-“From substantive to procedural rationality”, 1980, in Latsis, S. (éd.) Method and appraisal in economics, Cambridge: Cambridge University Press. -Models of bounded rationality: Behavioral economics and business organization (Vol. 1 et 2), (1982), The MIT Press. -Reason in Human Affairs, (1983) Stanford University Press, Stanford California. -Protocol analysis: Verbal reports as data, (avec Ericsson, K.A. ), (1984), Cambridge, MA: MIT Press. -Scientific discovery (avec Langley, P., Bradshaw, G. L., & Zytkow, J. M.), (1987), Cambridge, MA: MIT Press. -Models of thought (vol II), (1989), New Haven, CT: Yale University Press. -Models of my life, (1991a), New York: Basic Books. 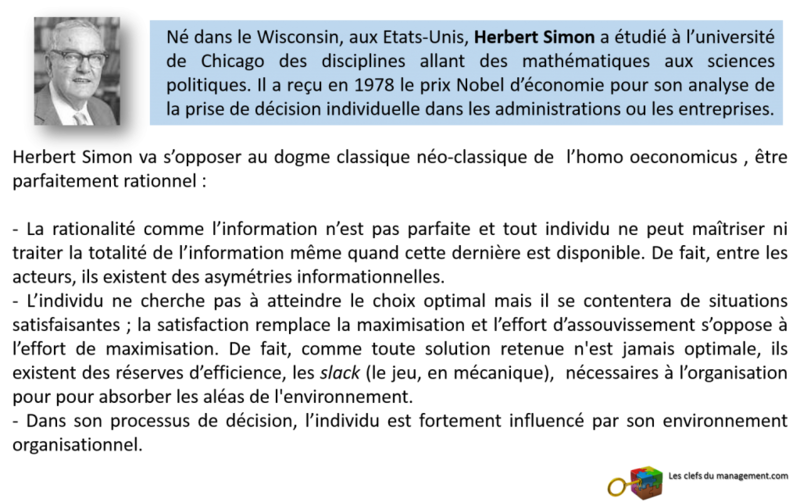 -Rationality in Political Behavior, Février 1991b, Carnegie Mellon University. -Models of bounded rationality: Empirically grounded economic reason (Vol. 3), (1997), Cambridge, MA: The MIT Press.